Adaptable - Spring, Summer, Fall or Winter. A variety of drinks available for every season. Why would you want to spend $4 every day on a Chai Latte or Crème Caramel Latte in the coffee shop when you can make them all at home? For free! Who Said You Must Use Dairy Milk? 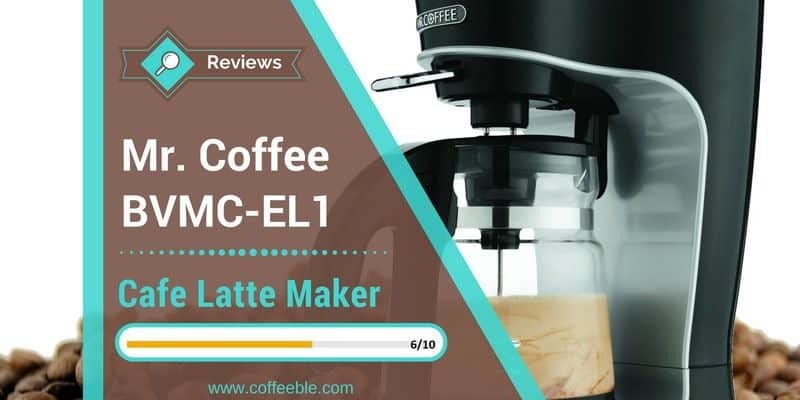 If you crave for these creative coffee drinks, the Mr. Coffee BVMC-EL1 Café Latte is the best latte machine for your home that deserves to be in your kitchen. We will look at the features in this home latte machine review in just a few minutes. I just can’t resist the temptation of teasing you first with a few examples of yummy coffee drinks. And once again, I want to emphasize that you can make all of these coffee drinks with one machine – The Mr. Coffee Café Latte maker! The desire you feel right now for a creamy Café Latte is completely normal so here’s your first chance to get one of Mr. Coffee’s Latte Maker right now! The Mr. Coffee Latte Maker’s best features are all focused on providing a quick and easy way to make lattes without wasting your precious time! It has a very powerful milk frother which, by the way, can also prepare you a delicious cup of hot creamy chocolate or even tea! 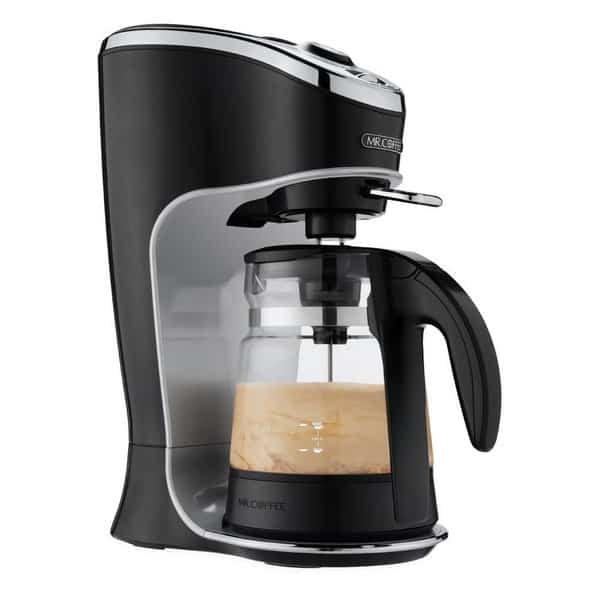 Once your drink is ready, the Mr. Coffee Latte Maker turns off automatically giving you a fresh and creamy Café Latte. The Auto-Off feature is important or it would otherwise burn the milk! But the latte maker has an option to reheat your coffee drink. Let’s assume, you can call yourself lucky and have all of the latte for yourself! When you come back after you have finished one cup, the left-over coffee drink has likely cooled off. All you need to do now is push the selection knob down to Heat/Froth and restart the latte maker. The included pitcher has a capacity of 24 ounces, which means that you can serve up to 2 cups at a time. As a side note, a latte is usually served in a 12 oz cup or glass. Related: Cappuccino Vs. Café Latte - What's The Difference? There are almost no reports of broken motors so it seems the internal machine is quite durable. I’m mentioning this since coffee makers from Mr. Coffee are not always very reliable over the long term. This latte coffee maker can produce a full carafe in about 8 minutes which is acceptable and within the recommended coffee brewing time. The Mr. Coffee Latte Maker has a smooth operating gear and is very quiet while brewing. You don’t have to worry about waking up your family in the morning! And don’t worry, you won’t disrupt the telephone conference at the office. And if you are bored of that standard coffee you make in your drip coffee maker then treat yourself with a huge variety of foamy latte’s right in your house. Make a range of lattes at home with the Mr. Coffee Latte Machine as it comes with a recipe booklet that consists of 20 latte and hot chocolate recipes. Satisfy all your latte desires and choose from a variety of coffee drinks! More than most coffee shops have on their menu! No need to give your hard earned money to the barista at a coffee shop! Get one of the Mr. Coffee Latte Maker now and be proud of your first homemade Cinamon-Sugar Latte. 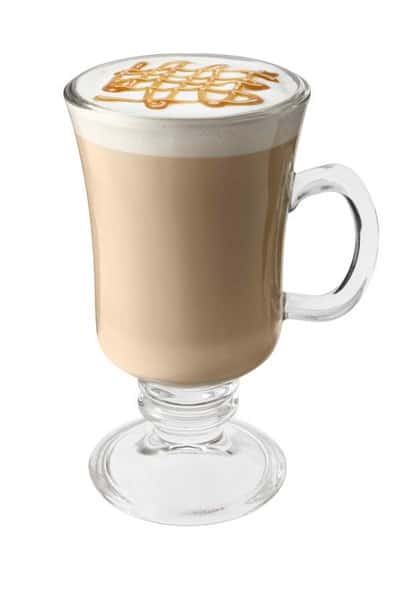 If you want to, you can try making regular coffee with the Mr. Coffee BVMC-EL1 Café Latte! Replace the milk in the pitcher with some water and start a regular brew cycle. Although, this is not an advertised feature of the machine you can still try it out – at your own risk! After you have gulped down the last drop of delicious latte it is time to get this machine shiny again! But don’t wait too long! Cleaning should be done after each brew cycle. Don’t let the left-over milk sit in the pitcher for too long! Or you may jeopardize the good taste of your latte the next time. Make sure to clean the pitcher carefully! It is equipped with its own heating element. So you must not put it in the dishwasher or immerse it in water. However, it’s not that hard to clean if you do it right away. Just follow the manual and you are good to go! One reviewer mentioned that he fills the pot with some water and a drop of dish soap and starts the heat/froth cycle to get it clean without lifting a finger. Good idea! The coffee brew basket, though, can be placed in the dishwasher! If you have a lactose intolerance, that does not mean you cannot enjoy great lattes! The Mr. Coffee Latte maker can handle any type of milk, be it Almond Milk, Soy Milk or even Coconut Milk. Results of milk froth may vary based on fat content and type of milk, but according to many user reviews, all types of milk create more than decent foam. Related: 3 Simple Ways To Make Creamy Froth At Home. But, whatever milk your favorite is, technically you don’t drink a 100% authentic latte. Let me be straight with you right now: the Mr. Coffee Latte Maker is still just an entry-level coffee maker combined with a milk steamer/frother. It does not brew real espresso which is required for a real, authentic latte. Therefore, it is not a real Café Latte. I got to admit, I have never tried the brewed coffee drink from this Mr. Coffee Latte maker. But with thousands of reviews and people raving about the produced latte drink, I would definitely give it a try! The nice thing about the Mr. Coffee Café Latte Machine is, that it brews your latte automatically. Of course, you can make cappuccinos and lattes with any espresso machine and milk frother – integrated or external. However, you have to froth your milk first and then brew your espresso. Sure, it’s doable but still, not the perfect solution if you focus on convenience. So in case you’re not 100% convinced of the Mr. Coffee Latte Maker (despite the great reviews), I give you two alternatives. This is a fully automatic espresso machine with integrated milk reservoir. It makes lattes and cappuccinos just as the Café Latte Maker but with real espresso. And it costs more! You can read my full review here or my post about the comparison of espresso makers under $200 here! With a Dolce Gusto single-serve coffee maker you can easily create hot and cold coffee drinks. Compared to the Mr. Coffee Café Latte Machine it brews authentic espresso drinks. But if you need your latte every day, the coffee capsules can get very expensive! Check the Dolce Gusto product line at Amazon, if you are interested in a single-serve capsule latte machine. Are you a latte lover and want to stop burning all your dollars in the well-known coffee shops? If you don’t want to spend hundreds of dollars for a new espresso machine, the Mr. Coffee Café Latte Maker is probably your perfect choice! The price is very affordable, it’s convenient to operate and the latte it brews will make your mornings much brighter! What are you waiting for! Get your Mr. Coffee Café Latte maker now! Drop a comment below if you want to share your experience of the Mr. Coffee BVMC-EL1 Café Latte with me.